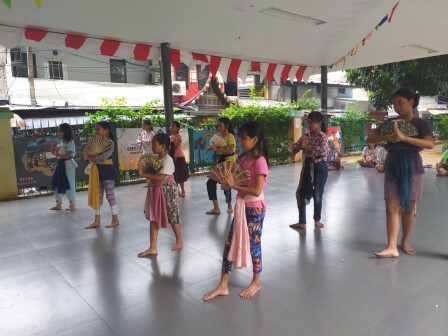 Children's enthusiasm to express their hobbies is endless indeed, like children who are seen practicing dancing in the Kebon Sirih Child-Friendly Integrated Public Space (RPTRA), Jalan Srikaya II, Kebon Sirih Menteng, Central Jakarta.
" I love dance. I joined here because of my own desires. This is exciting and knowledgeable"
They seemed engrossed in demonstrating the swift and graceful movements of traditional Betawi and Balinese dances, which are demonstrated by two trainers. As felt by one of participants, Salsa (12), said that she has been practicing dance at Kebon Sirih RPTRA since she was in grade 3rd. "I love dance. I joined here because of my own desires. This is exciting and knowledgeable," expressed Salsa, a 6th grade student of SDN Kebon Sirih 01 Pagi when being met at the location, Sunday (3/31). Similar statement also stated by Nabila (12) who is Salsa twin sister. "I joined this practice, as my school always holds dance events," she told. In the meantime, Kebon Sirih RPTRA Caretaker, Farida explained that it is a routine activity and free of charge. Most trainees are aged 5 to 13 years. "It's held to find talent from children thus they can be contested in dance competitions," she said.